In a world with 196 countries and about 6500 different languages (of which 1500 barely have more than a handful speakers), we have all experienced those moments in our lives when we realised that merely knowing one or two languages isn’t enough. Such situations may arise during job interviews, touring new countries, or even when you want to say something out loud that only your crush will understand, but the facts remain that knowing more languages is better. Not only is it good for communication but also for your brain; it’s a well-known fact that learning new languages creates new neural pathways in the brain making it faster and thereby making you smarter. Want to Sense Earthquakes near you? Then check out MyShake Android App for sensing them. However learning a new language isn’t as easy as it seems and hence Duolingo was created. Developed by Luis Von Ahn, Duolingo is a free only platform where one can learn way too many languages from a really big list of them. If you want to see movies on Android, Sony Crackle application is the best option for you. 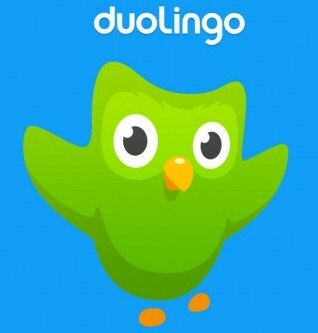 Duolingo is also available as an app for Android as well as for iOS where is offered a very user-friendly and simple UI and intuitive design. Language lessons include translations, spellings, pronunciations and the proper sentence formations. One can also ask doubts to all the fellow duos. What makes it better is that Duolingo makes repeat your lessons to keep the words in your memory and offers you sweets points (lingots as they call it) which you can exchange for stuff like common proverbs used in the language you are learning. Also the app can set reminders for you to make sure that you don’t miss a single lesson. Apart from this, Duolingo also keeps track of how fluent you are based on your answers which you can put on your LinkedIn profile. Also Duolingo certification is valid for many websites which allow you to work from the comfort of your home.